Sair de sua casa de campo e para seu barco! Casa de verão encantadora no Venetian Harbor com um dock. Localizado no prestigiado Groton Long Point. Recentemente remodelado com todas as comodidades. Minutos de Mystic histórico, Mystic Seaport, New England Aquarium, os casinos, golfe, campos de ténis no local com 2 praias privadas, uma comunidade de praia privada enorme família. Abra os olhos de manhã para a vista da praia e seu próprio barco sentado em sua doca. Você pode caminhar até a rua para o iate clube, desfrutar de pequeno-almoço e uma cópia do jornal (o iate clube também serve sanduíches e sorvetes durante todo o dia). Você vai ver as crianças passam com raquetes de tênis e coletes salva-vidas e trajes de banho, prontos para começar o dia de actividades organizadas. A atmosfera é agradável e amigável. Você pode levar mais alguns passos para Main Beach nesta comunidade praia privada. À noite você pode encontrar-se preparando para a festa do 'Olá Verão' ou família noite no clube de iate seguido por fogos de artifício. Você pode estar andando em místico para o jantar seja Mystic Pizza para a família ou uma feira mais elegante para os adultos. As atrações da área incluem Mystic Seaport Museum, New England Aquarium, US Base de submarinos da Marinha com o museu submarino, Ocean Beach Amusement Park, os casinos, lojas de antiguidades de Stonington, as adegas do Vinho Trail Connecticut, O'Neill Theater Verão, o Museu do Índio Pequot ea uma curta caminhada a Esker Point Beach gratuitamente quinta-feira concertos noite na praia. Relaxing Getaway with Friends! Beautiful home right on the water! We just returned from a wonderful week at this cottage feeling rejuvenated, relaxed and so pleased with our trip! We were looking for a beautiful home on the water for 7 of us women to celebrate our friend getting married. Considering we're all so busy, we just wanted a comfortable space to relax in, cook and kayak with great restaurants and attractions nearby. This home way exceeded our expectations! It was gorgeous and very comfortably sleeps 7 (3 full bathrooms was also a super plus!). For all the fun activities close by in Mystic, we actually chose to stay home most of the time - sunbathing on the deck, grilling and dining on the deck, walking on the beach and kayaking. The fact that we could easily launch kayaks from our dock was wonderful as was the 3 minute walk to the beach! We took daily kayak trips to nearby beaches and other areas, even did morning yoga on the pier. The kitchen is fully stocked, the house had everything we needed. Scott, the owner, was very accommodating, super friendly and ready to help in case we needed anything. After the experience we had this week, I definitely plan to go back and next time with family. I highly recommend this spot for families, romantic getaways or relaxing weeks to catch up with good friends. Can't wait to go back! p.s. An Uber ride to downtown Mystic is just $15. I highly recommend taking one night to go to The Oyster Club! This was our 2nd time staying at this adorable cottage in the family friendly beach community of Groton Long Point. We love the experience of staying in a quintessential New England, cedar shingled cottage. There is plenty of space for our family, with 3 updated full bathrooms and even the essential outdoor shower. The kitchen is equipped with all basic appliances and the access to laundry makes the stay even more convenient. There are lots of windows that allow a perfect cross breeze on a warmer day, and the deck is perfect for bbqing or just lounging. The location is fantastic! The deck overlooks the lagoon where we spent many relaxing hours watching the boats drift by and the sunsets over Bluff Point. The beach is within a very short walking distance, and the water is safe for children to swim. The Wednesday night regattas can be enjoyed from the shore on Main Beach, or the dock on South Beach. You can easily bike into Noank for breakfast or for a lobster roll at one of 3 different locally sourced seafood places. A little further, and you can reach downtown Mystic by bike as well! Scott is a great host: easy to contact, accommodating, and super friendly and we look forward to our next stay! We found this warm and most charming place on this website and fell in love with it the very first time we walked in 4 yrs ago. It exceeded any of our expectations. Our initial stay was 2 weeks followed by one month the following year and the past 2 years, we have been coming here for 6 weeks and loving every minute of it! It has great views, peaceful and beautiful setting and the best thing is, the owner is the nicest man in the world. We are very happy, don’t want to leave and plan to return next year. I enjoyed a sojourn at this lovely cottage on the Venetian Harbor and have nothing but wonderful things to say not only about the property itself, but also regarding the property owner and the amenities offered. 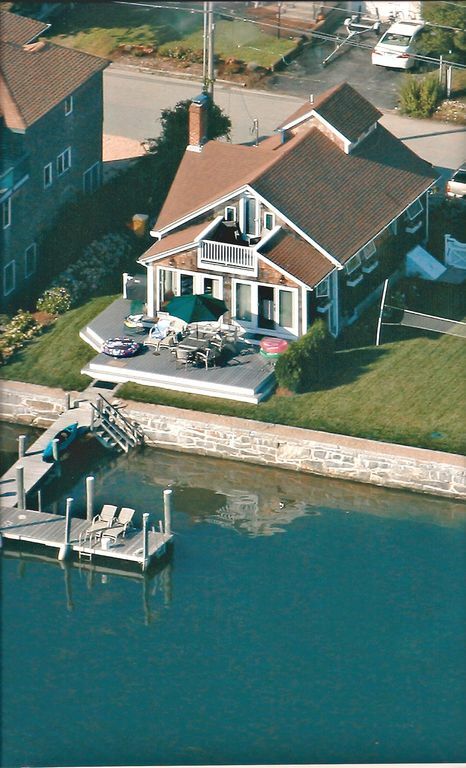 Groton Long Point is a beautiful seaside community and if you're looking for a summer vacation destination for your family; this cottage should top your list! Abra os olhos na parte da manhã para a vista o seu próprio barco sentado em seu dock. Você pode caminhar até a rua para o iate clube, desfrutar de pequeno-almoço e uma cópia do jornal (o iate clube também serve sanduíches e sorvetes durante todo o dia). Você vai ver as crianças passam com raquetes de tênis e coletes salva-vidas e trajes de banho, prontos para começar o dia de actividades organizadas. A atmosfera é agradável e amigável. Você pode levar mais alguns passos para Main Beach nesta comunidade praia privada.